It was a very proud moment for all of us to participate in “Tree Plantation Drive”. 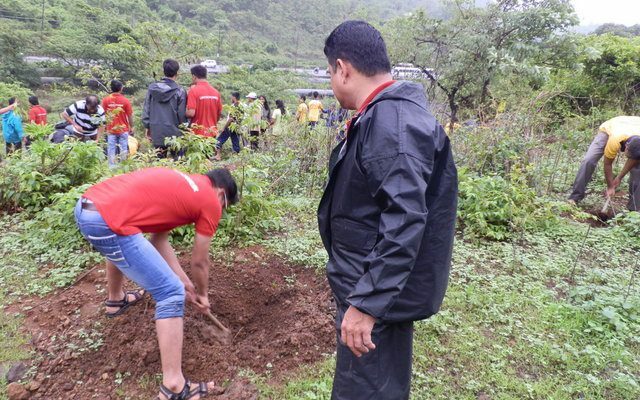 Siemens Workers’ Union, Vanarai Giriraj Trekkers and Family members of our employees participated in the project “2 Crores Tree “ by Government of Maharashtra. On 3rd of July 2016 we along with “HARIYALI” planted 500 trees in a span of three hours. This was only possible because of the team work of all the participants. The discipline observed was remarkable. First of all the total participants were divided into ten groups of 15 each and five groups were given the task of transporting the saplings to the location where they were to be planted. The other five groups were given different locations to dig pits and plant the saplings which were transported by the first group. They also gave support with dry stems to the weak stems of the saplings for them to withstand the heavy rain pour. In the second half the roles of the groups were interchanged and this gave them the opportunity to do the actual task of planting trees. this sort of perfect planning resulted in achieving the target of “500” trees. In year 2014 Siemens Workers Union participated in tree plantation drive at Bhavale near Shahapur with “Hariyali” an organisation devoted for conservation of nature. Siemens Workers Union had arranged for snacks and refreshment for all the participants. Siemens management also supported this noble task by providing with bus service. Let us keep this spirit of our devotion towards the conservation of nature and keep participating in such programs in huge numbers in the future also. Your team has demonstrated discipline and unity during tree plantation. Your team has planted around 500 trees. We hope your relationship with “Hariyali’ will continue forever.